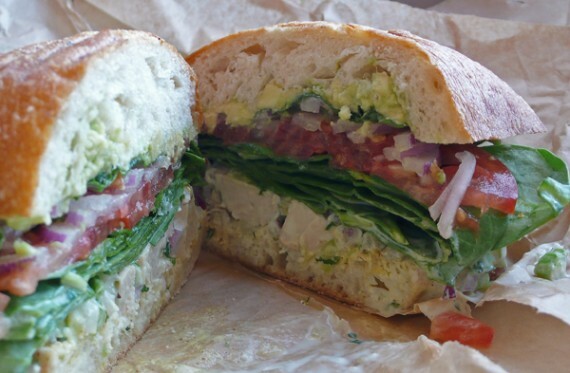 When I had the Vegan chicken salad at Whole Foods Las Vegas my heart skipped a beat. It was love at first bite! Spot on texture, impeccable taste and so satisfying! Sensational. I had to know how to replicate this sweet little bite of fantastic perfection. I know what goes into traditional chicken salad so I assumed that would be the same. What I wasn’t sure about was the “meat”. It definitely wasn’t tofu… so I read up on different Vegan “meats”, googled similar recipes and decided to give Seitan a try. What IS Seitan you ask? According to Ask.com: Definition: Although it is made from wheat, seitan has little in common with flour or bread. Also called “wheat meat”, “wheat gluten” or simply “gluten”, seitan becomes surprisingly similar to the look and texture of meat when cooked, making it a popular meat substitute. Seitan is also high in protein, making it a popularprotein source for vegetarians. Asian restaurants often use seitan as a vegetarian mock meat, and seitan is also the base for several commercially available products such as Tofurky deli slices. Seitan can be prepared by hand using either whole wheat flour or vital wheat gluten and is made by rinsing away the starch in the wheat, leaving a high-protein gluten behind. Although not as common astofu, seitan is quickly gaining popularity, particularly in vegetarian restaurants, due to its ability to take on the texture and flavor of meat. Prepared seitan can be found in the refrigerated section of most health food stores. Interesting, right? I thought so too! So I hoofed it on down to my local health food store and picked up a pack to give it a try. The result was an even more amazing version! 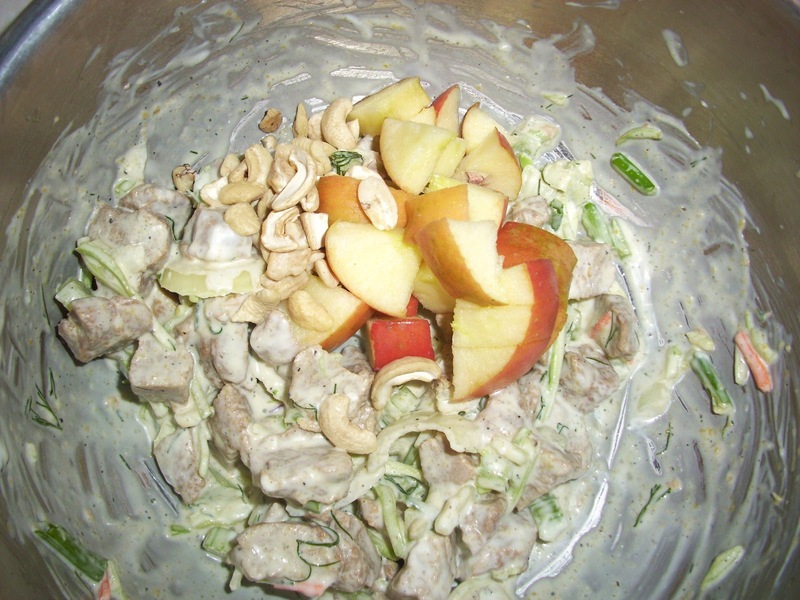 Mine has a slight twist from fresh dill, more crunch from broccoli slaw and a beautiful sweetness from Ambrosia apple! Oh. Friends. You HAVE to try this one!! Trust me when I say, no carnivore will know the difference!! 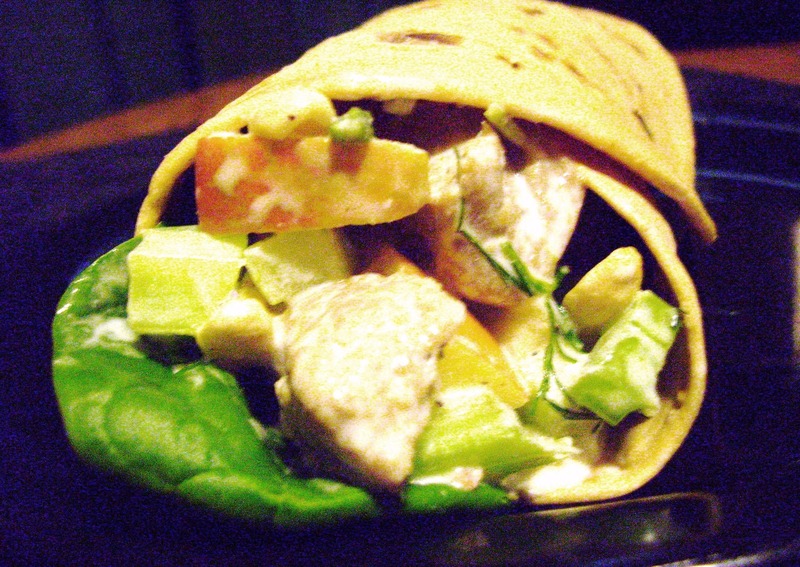 * I used Flatout wraps as a bed for my “chicken” salad but you could use sprouted grain bread/tortilla, light bread, sandwich thins, a bed of greens…you name it! BYOV (Be Your Own Vegan!) and get creative. This stuff really could be eaten out of the bowl with a spoon it’s so good! 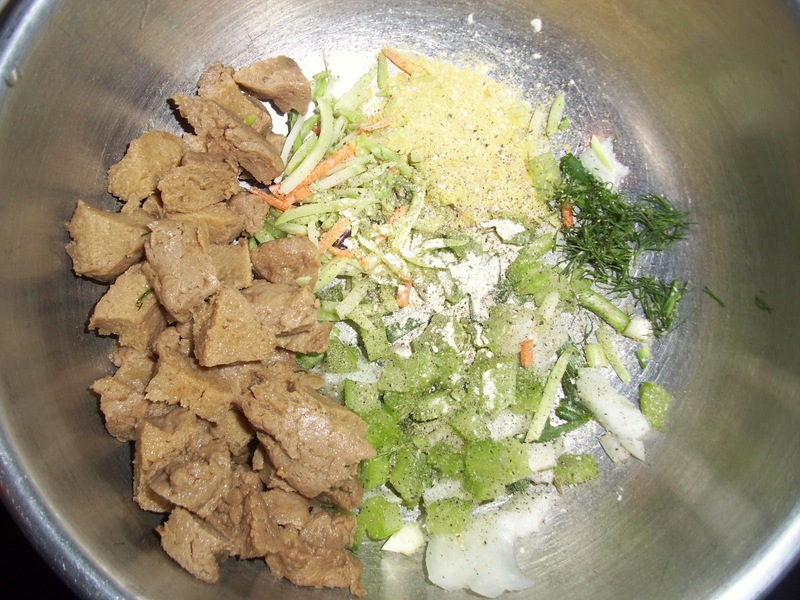 Directions: Mix together the seitan, green onion, red onion, broccoli slaw, celery, dill, Vegenaise and all the seasonings. Then fold in the apple and pecans. And that is it! Dive in as is, roll up in a wrap or put it on some bread! For those of you trying to convert your family into eating more Vegan meals-without them knowing, this recipe is for you! It’s perfect for lunches, it keeps well in the fridge and the taste only gets better with time! Let me know how you like it! Although, I may hear you squeal with delight from here.